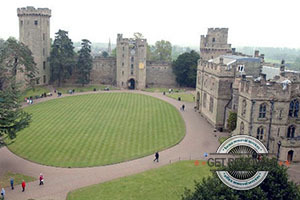 Warwick Castle dates back to the 11th century and for nine centuries was at the heart of the British history. Today the magnificent feudal fortress is considered to be England’s finest medieval castles. The castle was built by the order of William the Conqueror in 1068, just two years after the famous seminal Battle of Hastings. It is situated on a commanding position on an escarpment above the Avon River. The position of Warwick Castle was described as “the noblest site in England” by renowned English novelist Sir Walter Scott. The castle was originally built to keep unwanted “guests” away. Today this is the second most visited castle in the country, after the famed Castle of Windsor. Warwick Castle is also more visited than any other English house in private hands. Visitors from all over the world come here to witness the amazingly well preserved structure of the fortress, and to see in first person the numerous entertainments that it provides to its guests. The most famous entertainments of this landmark are known as the Castle Dungeon and the Pageant Playground. The interior of the castle is as fascinating as the exterior. It showcases one of Europe’s finest collections of medieval weaponry and armor. Also a large collection of works of art by renowned artists such as Rubens and Van Dyck is display throughout the halls, rooms and galleries. The castle’s garden is also a breathtaking site. It spreads over 60 acres of lush green lands which were landscaped by famed landscape architect Lancelot “Capability” Brown. Nearby also lies Kenilworth Castle. It is not as popular as Warwick Castle but its present ruins have their own fair share of history which is well worth seeing in person. At one point in time, Kenilworth Castle was owned by “Bad” King John. Its ruins are so impressive that Sir Walter Scott immortalized it by writing his 1821, novel “Kenilworth”. Both Warwick Castle and Kenilworth Castle lie in close proximity to the city of Birmingham which is the second most populous city in the United Kingdom. It has the perfect location for tourists that wish to visit both castles and the other nearby landmarks. Birmingham is served by the Birmingham International Airport which makes the city very accessible even for foreigners. On the other if you are not a foreigner and you have recently gone through a stressful local or inter-city removal, why don’t you decide to unwind a bit and go visit at least one of these two amazing castles? Know that you can use removal services the next time that you are facing a relocation. By doing so you will not only facilitate your move drastically but you will also lower the stress levels that come with a removal. Even more you will have the peace of mind that your move is being handle from start to end by professional movers with numerous years of experience under their belt. While you are visiting one of the two castles, make sure that you take a lot of photos as you will want memories from the trip.